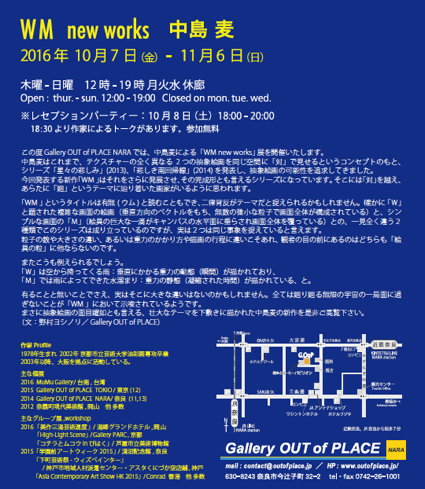 Open : thu. - sun. 12:00pm - 7:00pm　※Close on mon. tue. 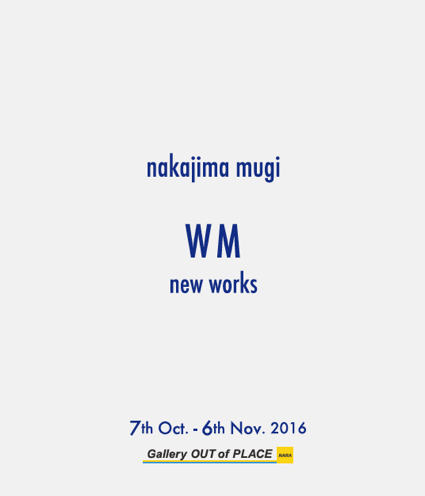 wed.
Gallery OUT of PLACE NARA is pleased to announce the opening of nakajima mugi’s exhibition,“WM new works. in his continued pursuit of stretching the boundaries of abstract painting. In his newest “WM” works, he further opens the scope for his concept in what could even be considered a series that arrives at full completion. It seems that the artist has finally overcome the theme of "contradiction" and has arrived at the theme of "resurgence." The title, “WM,” can also be read in Japanese as umu, meaning “presence or absence.” Perhaps its theme can then be viewed as the notion of antinomy. 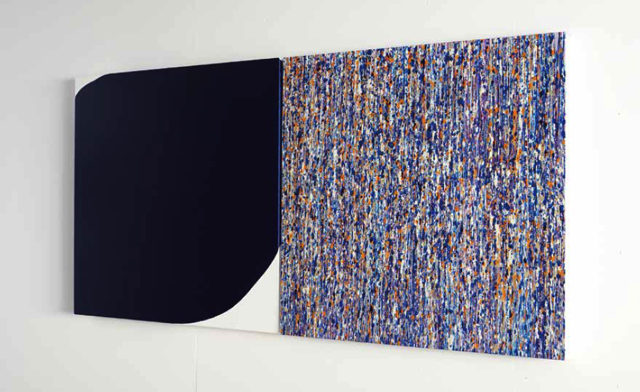 At first glance, the painted surface entitled “W” (vertical vectors and countless microscopic particles make up the entire composition), and the simple surface of “M” (a giant drop of paint is dripped horizontally, covering the canvas) are put together as two seemingly different types of paintings. The two pieces, however, can be viewed as capturing the same matter. Perhaps there is actually not a huge difference in even the opposing matters of presence and absence. “WM” appears to suggest that our entire world is nothing more than the endless, oscillating universe held within one sphere. Our gallery invites you to view what can be seen as abstract painting bolstered to the next level in the immense theme underlying nakajima mugi’s newest works.